Most of the birds on this page have Eurasian origins; others are so designated. These birds appear to be free, but their wings are clipped. Male Red-crested Pochard (Netta rufina), Duke Gardens, 10/23/04. Male Hooded Merganser (Lophodytes cucullatus), Duke Gardens, Durham, NC, 12/15/02. 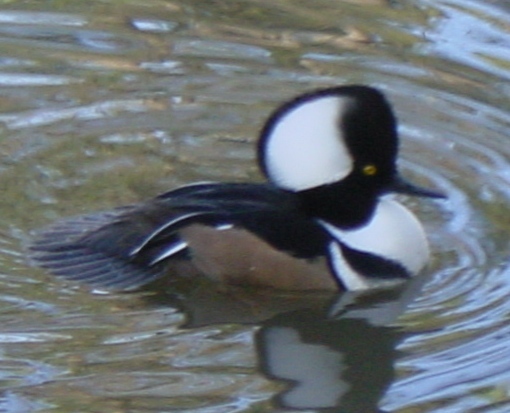 This duck is a member of a native species which winters here, but this is also the edge of its breeding range. Male Mandarin Duck (Aix galericulata), Duke Gardens, 4/2/05. This duck appeared at the far end of the Asian garden. Philippine Duck (Anas luzonica), Duke Gardens, 2/22/05. Ruddy Shelduck (Tadorna ferruginea), Duke Gardens, Durham, NC, 12/30/05. Barnacle Goose (Branta leucopsis). This goose was the bully of the bunch at Duke Gardens on 7/19/05, walking around squawking loudly on the grass, then bumping a duck from this rock. Barnacle Goose couple, Duke Gardens, 3/9/06. These geese were on their best behavior.